Our second day in Singapore began really early. It's a good thing that Paul and I took the time out to drop by the convenience store that was located at the ground floor of our hotel to buy a couple of instant noodles the night before. Since call time was at 8 in the morning, eating breakfast inside the room is the most sensible thing to do to save us more snooze time. After quickly getting dress, our group met up again at the hotel lobby to wait for the organizers of our tour. At exactly 9AM we rode our assigned bus and our Uniquely Singapore tour was just about to begin! Located just a couple of minutes away from our hotel, we quickly got to our first stop. Clarke Quay is located along the Singapore River and is a popular night destination among the locals. During the day, we enjoyed watching the peaceful clean river as colorful ferry boats goes up and down bringing passengers through the entire stretch of the river. Too bad we had very limited time available that Paul and I were not able to go on a romantic ride down the river. Just around the corner in Clarke Quay is the Royal Selangor Museum. This is the world's larger pewter company and is known in producing the nicest art works made out of ... pewter! Taking a short tour around the museum, I found out that Pewter is a combination of Tin, Antimony and Copper. We ooh-ed and ahh-ed over the beautiful works of art that the staff has carefully crafted. Just when you thought, that's all you can do inside the Royal Selangor Museum, well there's actually one more! 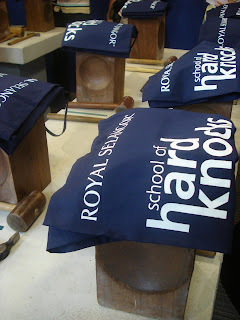 In order to fully appreciate the beauty of pewter, why not join the School of Hard Knocks. This is one exciting activity that you can do especially when traveling in a big group. Together, you'll be able to unleash your creativity as you engrave, mold and clean off your new pewter bowl! This is a good way to release some stress too! Clarke Quay during the day is truly peaceful. I can't wait to go back and witness the night scene in here soon. Upon receiving my itinerary from the organizer, I was literally jumping with joy when I found out that we will actually be riding the Singapore Flyer! This is the world's larger observation wheel, standing at 165m or 42 storeys from the ground. The ride will take you around for 30 minutes where you can see the F1 race track, the Merlion Park, a number of hotels and stunning skyscrapers, the Esplanade, and a lot more! The entire flyer has 28 fully air-conditioned capsules that has a capacity up to 28 passengers each. This is truly an engineering work of art that has showed the world one of the things that Singapore has to offer. We had a wonderful time taking photos and enjoying the sights during the entire ride. It was truly one exciting experience that one should enjoy when visiting Singapore. After our memorable ride up the Singapore Flyer, we felt our stomach rumbling and begged the organizers for lunch. Thankfully, our kind tour guides just had the same thing in mind and without losing any minute, we boarded our bus to take us to our next stop. In every country, there will always be a Chinatown. This is normally the place where most Chinese immigrants/settlers stayed back then. While most of the Chinese locals have chosen to live further out, Chinatown has remained to be a place where visitors can learn about the Chinese culture, eat delicious Chinese cuisine and shop for affordable Chinese products. Another reason why you should include Chinatown into your itinerary is simply to have lunch at the infamous Maxwell Food Center. This al fresco hawker center houses a number of best-selling dishes that can really create long lines during the peak hours. Let me tell you about our lunch in my succeeding entries. After our delicious lunch, we decided to just walk around Chinatown some more before heading to my favorite place in Singapore -- Orchard Road! We entered a Buddhist temple where we witnessed a praying ceremony being down, we payed our respects and left right after. After following the directions given by some kind locals, we reached the Chinatown Market where I had to stop myself from going on a shopping spree since I know I'll be able to indulge on a grander retail therapy in our next stop. 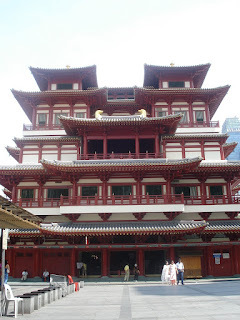 While looking for the nearest bus stop, we immersed ourselves with Chinatown by observing the different architectural designs of the buildings and homes that seems to have been around for decades and maybe some even close to a century already. Finally, we found the bus stop and waited for the right bus that will bring us to Orchard Road. Let me tell you about our Orchard Road adventure tomorrow. While our tour around Singapore was really short and it barely hit the must-sees such as the Sentosa island, the Singapore Zoo and Night Safari, Paul and I still had a wonderful morning as we had a better glimpse of the beauty of Singapore. At least, we still have a lot more spots to visit which gives us more reason to plan our return soon. 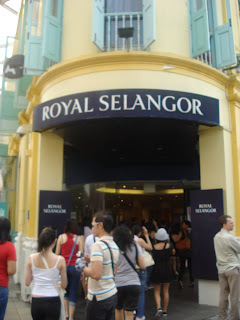 Royal Selangor Museum is located at 3A River Valley Road, Clarke Quay, Singapore. Singapore Flyer is located at 30 Raffles Avenue, Singapore. luv the post Franny :) it was lotsa fun at SG!